Xinjiang or East Turkestan is an autonomous region in China. The area also known as Uyghuristan. China executes so much pressure to Uyghurs and Tibets in East Turkestan. 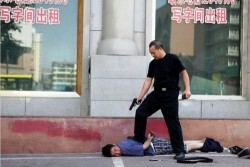 The Chinese country and people kill Uyghurs and Tibets everyday. There is an ongoing genocide in the region. This site is dedicated to genocided Uyghurs and Tibets in East Turkestan. We are sharing videos, photos and stories of dead Uyghurs killed by Chinese. Please say stop to this crimes. Please stop Chinese. Please support and help Uyghurs.